Tech Promo Products Boost Your Brand | TJM Promos, Inc. When you consider promotional products today, you have to think tech. Sure, there’s always a place for customary promo favorites such as pens, mugs and apparel. 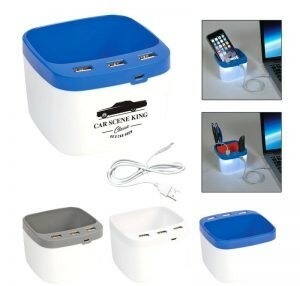 But if you want to get potential buyers’ attention today, tech promo products are a must! Today’s world is tech-centric, from phones to tablets, to laptops, to fitness trackers. If you want your promotional products to boost your brand’s value, you have to tap into it with products that people want. That’s not likely to be the old-fashioned ballpoint pen. You need to give people something they’ll value in their everyday workplace. Fortunately, there’s a whole world of tech promo products you can customize with your brand or logo. For example, you can start with flash drives. Get your logo custom imprinted on the side, and maybe even add a (short) video promo on the drive itself. You’ve just given your customers something they can use. Tech products are available in a wide range of styles, shapes, sizes, color and prices. There’s something to fit virtually any need or budget. You can go as simple or complex as you want. Cable organizers and phone or tablet stands are an economical way to get your brand onto products that people will use and are sure to appreciate. Keep your logo in their mind, and your contact information. It’s right there when they’re ready to buy your product or service. Custom printed power blocks, USB hubs and travel adapters are a terrific way to stay in touch with customers who are on the go. Give them something they can use in their travels, and they’ll have a positive impression of your brand every time they use the product away from home. For high-value customers or for employee recognition, step up to more serious products. Bluetooth speakers make a fantastic thank-you product or employee reward. In a connected world, every aspect of your marketing has to be in tune with modern needs. That includes your promotional products. Tech promo products are a way to show your customers, employees, vendors or members that your company is keeping up with their needs. This entry was posted in Posts and tagged Bluetooth, phone, tablet, tech promos, USB.